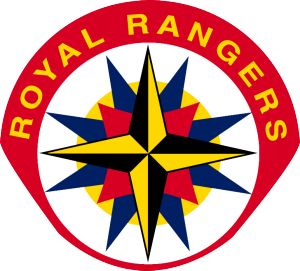 Royal Rangers was accepted as the official boy’s ministry of the International Pentecostal Holiness church in January 1985, at Ridgecrest Conference center in Asheville North Carolina under the direction of National CE Director Rev. Wiley T. Clark. Commander Art Webb from the National Assemblies of God Royal Rangers was onsite to present the program to the IPHC leaders. The program was ratified as the IPHC’s official boys ministry and Commander Ed Wood took the reigns as the First IPHC National Commander. Commander Wood was at the helm of royal rangers from its ratification until 1988. In 1988 Commander Paul Howell became the second National Commander for the IPHC Royal Rangers Ministry. Commander Howell led Royal Rangers though 1992, and sponsored the first National Camporama held at Camp Rainy Mountain in Clayton, Ga. The Theme of this Camporama was “Mining for Gold”, as portrayed by the gold panner on the Camporama patch seen above. This was the first time that the IPHC Royal Rangers used a diamond shaped patch and this shape was reserved for used only at Camporamas or other special occasions for the Royal Rangers National Office. In 1992 the first National FCF Rendezvous was held at Dexter Carroll’s property, Walnut Cove, NC, under the leadership of Al Wheatley, National FCF President. The arrowhead patch pictured above was established as the official Rendezvous patch shape to be used on both the National and Regional levels. In 1992 Commander Paul Howell moved on to be National C.E. Director and Commander Bobby Forehand was appointed as the third National Commander. Commander Forehand served as National Commander until 1998 when he resigned. During his 6 years as National Commander he sponsored the Second National Camporama at the PTL Club in Rock Hill, SC. The theme of this Camporama was “The Price of Freedom”. In 1996 National FCF President Alan Atkins sponsored the second national FCF Rendezvous at Jerry Hayes farm in Coward, SC. Upon Commander Forehand’s resignation in 1998 Commander David Moore was appointed as the fourth National Commander of the International Pentecostal Holiness Church. Due to this leadership change in scheduled year of the 3rd National Camporama the camp was postponed for a year and held in July 1999 at Camp Bowers Boy Scout camp in Fayettville, NC. The Theme of this Camporama was “Discovering Hidden Treasure” which was brought life in pageant where boys and men were brought on board a Pirate Ship that is in search of treasure; however the treasure that the attendees found was not one of silver and gold but of the Love of Jesus. Keeping with the 2 year offset between Camporama and Rendezvous, the 3rd National Rendezvous was held in 2001 at Dexter Carroll property Walnut Cove, NC. The theme of this camp was “Old Paths”; the Guest Speaker was Jacques LaChristian. In 2003 the Fourth National Camporama “Time Quest” was held at the Cornerstone Conference Campground in Brown Summit, NC. The week made use of the facilities with activities such as rock climbing on their rock wall and riding the zip line across the lake. This week all built up to “Team Extreme” a team of bodybuilding minsters who brought the Word of God to 1200 boys and men in attendance. The 2005 National Rendezvous as also held at Brown Summit, NC. The theme of this Rendezvous was “God’s Warriors”. In 2007 we returned to Brown Summit, NC once again for the Fifth National Camporama “The Greatest Show on Earth”. This Camporama featured a pageant that put the boys and men in a comedic circus show, with acts such as the bearded woman, the strongest man on earth, and the crowd favorite, Super Dave. The fifth national Rendezvous “Living Waters” was held in 2009 at the North Carolina Conference’s new facility Camp Freedom in Falcon, NC. The Royal Rangers have enjoyed 25 great years of ministry in the International Pentecostal Holiness Church, and with God’s help we will enjoy many more years of this ministry that has touched thousands of Men and Boys’ lives.